We’d love your help. Let us know what’s wrong with this preview of Emily Eternal by M.G. Wheaton. Meet Emily, "the best AI character since HAL 9000" (Blake Crouch). She can solve advanced mathematical problems, unlock the mind's deepest secrets, but unfortunately, even she can't restart the sun. Emily is an artificial consciousness, designed in a lab to help humans process trauma, which is particularly helpful when the sun begins to die 5 billion years before scientist Meet Emily, "the best AI character since HAL 9000" (Blake Crouch). She can solve advanced mathematical problems, unlock the mind's deepest secrets, but unfortunately, even she can't restart the sun. Her beloved human race is screwed, and so is Emily. That is, until she finds a potential answer buried deep in the human genome that may save them all. But not everyone is convinced Emily has the best solution--or the best intentions. Before her theory can be tested, the lab is brutally attacked, and Emily's servers are taken hostage. To ask other readers questions about Emily Eternal, please sign up. Visionary. The best AI character since HAL 9000. This is a unique book. It's an SF novel featuring a main character who is an AC (not an AI) - an artificial consciousness. It's a book about the meaning of humanity and what happens when humanity accidentally creates a God. And, finally, it's a romance. It's very much a romance novel, which surprised me. The romance is a unique one, at times disconcerting, but saved by a main character I loved - artificial or not. I liked this one. I loved the ethical and moral quandaries, was surprised more than onc This is a unique book. I liked this one. I loved the ethical and moral quandaries, was surprised more than once by the directions the author took, and was delighted by the ultimate conclusion. Glad I read this one. This was an unpredictable sci-fi about a suddenly changing earth in the face of the sun turning red giant and an artificial consciousness, Emily. Emily is the protagonist and she’s spent a few years adjusting to humanity, trying to become as human and empathetic as she can. Emily grew exponentially from a cog in a wheel, a team player in a university scientific department, to working independently for the good of humanity. Her decisions and actions were sometimes questionable and I never knew wha This was an unpredictable sci-fi about a suddenly changing earth in the face of the sun turning red giant and an artificial consciousness, Emily. Emily is the protagonist and she’s spent a few years adjusting to humanity, trying to become as human and empathetic as she can. Emily grew exponentially from a cog in a wheel, a team player in a university scientific department, to working independently for the good of humanity. Her decisions and actions were sometimes questionable and I never knew what was around the corner. The side characters were enjoyable elements, especially Jason and Nathan. This was a gripping story from the beginning with the occasional moment of craziness where I thought, where is this going? Then, the penny would drop, jigsaw pieces would fall into place and I’d have an ah-ha moment. It was a clever plot, most of which was reasonably easy to follow. There were some out there moments in the last 10% as the story reached its culmination, but overall this was a satisfying read that I would recommend to all sci-fi fans. Emily is an artificial consciousness, programmed to read people, and help them with their problems. Threatened with the end of the world, her super-computer and her scientists are enlisted to try and preserve humanity. Emily is an artificial consciousness - not artificial intelligence. She's not really sure she can quantify the difference, but it's very important to her. She was designed by scientists to learn and replicate h Emily is an artificial consciousness, programmed to read people, and help them with their problems. Threatened with the end of the world, her super-computer and her scientists are enlisted to try and preserve humanity. Emily is an artificial consciousness - not artificial intelligence. She's not really sure she can quantify the difference, but it's very important to her. She was designed by scientists to learn and replicate human mannerisms, to be able to access their memories, and sooth their pain. Her program is only in the early stages, but it could be a significant, therapeutic help; especially as the world is coming to an end. The sun is expanding, an event that everyone said wouldn't happen for billions of years. It was bad enough when they thought they had years - but now there's only weeks left. Emily's talents as a super-computer are called upon, in a last-ditch effort to try and preserve some semblance of humanity for the future. But there are other people, working in the shadows, trying to hijack her plans, which will effectively doom mankind. I really liked Emily, she's smart and funny. She's well-aware that she's a computer, and likes to adjust her program, to choose her own personality. She develops opinions of the people around her - friendships, and those she doesn't quite trust. Her program is only five years old, and despite having the appearance and maturity of someone in their thirties, Emily is still very innocent. It's quite sweet watching her hold firm to her morals, because her creator did - and then because she's decided it's the right thing to do. The story really does examine what it means to be human, and a god (or goddess!). That people are a messy, faulty bunch; but they're generally a well-meaning group that deserve to be saved. It also looks at the lengths you could go to save them, and whether you should. Everything was great, and I was completely on board, until the last act. I still enjoyed it, but it was a leap too far for me. It was a very clever path to take, but after how systematic everything was, I felt the ending was "And so this happened. The End." Overall, this was a 4.5 out of 5 for me. I look forward to reading more of Wheaton's work. This book really grabs you from the first line: “It’s dark, way too dark for the middle of the day. And that’s not where the sky’s supposed to be”. So, apocalyptic SciFi – like it said on the cover. But, then suddenly you are inside a young woman’s head who is undergoing psychological therapy for a teenage trauma. The world is about to end, and someone is being treated for a long-ago tragic loss. Soon, five billion plus people will be irreparably traumatised – if they are not already. Why bother This book really grabs you from the first line: “It’s dark, way too dark for the middle of the day. And that’s not where the sky’s supposed to be”. So, apocalyptic SciFi – like it said on the cover. But, then suddenly you are inside a young woman’s head who is undergoing psychological therapy for a teenage trauma. The world is about to end, and someone is being treated for a long-ago tragic loss. Soon, five billion plus people will be irreparably traumatised – if they are not already. Why bother? But this is what Emily has been built for – to “empathize with mankind … to become the world’s first non-human psychiatrist/brain researcher, versed in unlocking the mind’s deepest, darkest secrets and misspent potential in hopes of bettering mankind”. Emily is the narrator, and it is impossible to not think of her as a human being relating her life story. She has no actual body – she exists in a myriad of computer servers and the interface chips through which she communicates directly to human brains. People interacting with Emily can see her, and feel her – as she stimulates their neurons to accept her ‘physical’ presence. Emily takes her empathizing very seriously. She needs to know how humans feel, react, live … “I want to see the world. I want to be of the world. No, I need to see and be of the world. Before it’s too late”. So, she ‘washes’ and ‘brushes her hair’ when she ‘gets up’, She ‘walks’ around the campus where she was ‘born’ – even though she could jump almost instantaneously from one spot to another if there are computer connections. But, time and movement are important to humans, so they are important to Emily. She even falls in love – and I dare you to not believe fully in her (reciprocated) love affair with Jason. However, Emily has a job to do – somehow she must come up with a plan to save the human race. The first step is to preserve a record of the genetic makeup of EVERY living human. There is a brief discussion of the ethics of doing this without people’s consent, but time is short and Emily’s moral objections (Yes! Emily has VERY strong morals, as every psychiatrist should) are satisfied, so long as only she and her mentor, Nathan, have access. While collating all the data, Emily finds a possible solution – but before she can discuss it with anyone, her lab and servers are all trashed, her ‘colleagues’ are all murdered, and Emily is on the run with Jason. It seems someone else also has a plan, and they do not want Emily interfering. The new plan involves selecting “Fifteen hundred allegedly genetically superior people” and blasting them into space to eventually form new extra-terrestrial colonies. Emily is not convinced of the viability – or even the ethics of such a plan: “superior according to whose standard?”. It all smacks too much of eugenics (and the Dr Strangelove Mineshaft plan). Also, “Millions of years of evolution honing a human to hunt on Earth means nothing other than they’d be completely out of place in an extra-terrestrial environment”. Of course, there is another worrying twist to the second plan. Which plan will win through? Can both plans work together? Is there any time remaining? There are some many questions brought up by this book. Should mankind be saved? What does it mean to ‘save mankind’? What makes us human? Our DNA? Our physical appearance? Our cultures, and shared civilisation? Our experiences? Love? Our ability to think, debate and create? Our advanced scientific technology? Emily sees her opponent as believing that “keeping them alive and breeding new generations is the same thing as preserving mankind”. Emily disagrees. Emily is one of the most beautifully developed and believable characters ever in fiction. In a world brought up on the “Terminator” films and their ilk, it is so nice to have computer generated entities who really do want to put humanity first – even if their methods might be inhuman. I can really highly recommend this book to everyone. Other excellent books dealing with similar themes and ethics are “Chaga” by Ian McDonald, and the “Bridgers” series by Stan C Smith. I loved this. Something different and highly engaging but also randomly thought provoking on many levels. Emily may be virtual but she reads as entirely human, she loves the human race and learns every day about the nuances of that existence. On a dying world where humanity is about to be wiped out Emily lives, grieves, falls in love and just possibly comes up with a way to save human kind. The writing is beautiful, fully immersing you into this world and the plot is considered yet pacy and addict I loved this. Something different and highly engaging but also randomly thought provoking on many levels. The writing is beautiful, fully immersing you into this world and the plot is considered yet pacy and addictive. The science geekery is wonderfully fascinating and whilst speculative still entirely believable on the page. I devoured this in short order, plenty of emotional levels and edgy moments, a cleverly exciting and intelligent finale and some memorable characters not the least of which is Emily herself. Brilliant. Very entertaining and original take on the Apocalypse, featuring a delightful Artificial Consciousness, Emily, who wants nothing more than to save the human race that she loves so much. I think the ending is a bit 'out there', hence four stars and not five, but nevertheless this is an enjoyable science fiction romance. Review to follow shortly on For Winter Nights. This was the first book that pulled me in after the traumatic loss of my dog, so that's definitely a factor in it's favour. I felt invested in Emily almost immediately, and she made me laugh and kept me reading. The book kept me guessing, and I definitely didn't see the last 20% of the book coming. Will definitely be reading more books by this author in the future! Tandie I’m sorry about your dog. It really is awful; they’re a part of your family. Figgy Thanks Tandie. Yeah, it was a rather traumatic event and I'm still recovering emotionally, and it's still with council and the court. I'm not sure what Thanks Tandie. Yeah, it was a rather traumatic event and I'm still recovering emotionally, and it's still with council and the court. She was my family. I mean, I have human family obviously, but they all live interstate and have their own lives. Mum is remarried, sisters have a different dad. Dad is remarried. My Nana passed away at the start of March. My ex and I recently separated after 8.5 years together. So she was literally my everything. Emily is an AI program. Well, more of an Artificial Consciousness designed to be a therapist in 3D.Able to be seen with an interface, Emily can correct human errs of her programer. But, Emily was actually taught not to take over any human conscience. EMILY ETERNAL, by M.G. Wheaton, combines the elements from "WHEN WORLDS COLLIDE" and "SING THE BODY ELECTRIC," into an Emily is an AI program. Well, more of an Artificial Consciousness designed to be a therapist in 3D.Able to be seen with an interface, Emily can correct human errs of her programer. But, Emily was actually taught not to take over any human conscience. Wow. This novel went in a direction I didn't expect. It's rare that a book exceeds your expectations for both plot and character. It's even rarer that an author allows the emotional journey of the main characters to play out naturally and, in turn, affect the reader in such a deep, meaningful way. 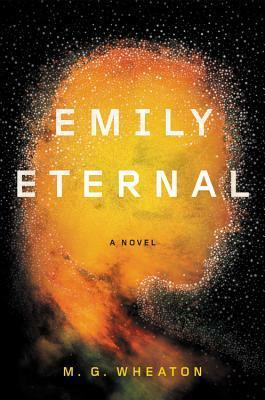 EMILY ETERNAL is expertly written by Wheaton, showing an impressive knowledge of both current tech, and the conceivable trajectory of what is to come. This is a novel of tomorrow that is very much a nov Wow. This novel went in a direction I didn't expect. It's rare that a book exceeds your expectations for both plot and character. It's even rarer that an author allows the emotional journey of the main characters to play out naturally and, in turn, affect the reader in such a deep, meaningful way. 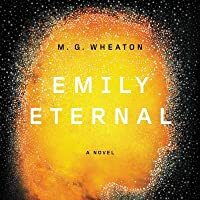 EMILY ETERNAL is expertly written by Wheaton, showing an impressive knowledge of both current tech, and the conceivable trajectory of what is to come. This is a novel of tomorrow that is very much a novel of today. Wheaton manages to balance adventure, suspense, thrills and spills, whilst exploring the biggest concern of our age: the health of our planet. Although it is the death of our sun (among other things) that concerns the characters of EMILY ETERNAL, unhinged global warming would surely result in a similar outcome. The question at the heart of this book is How can we survive this cataclysmic event? Well, that is the definitive question of our age. How can we prevent our planet from dying? EMILY ETERNAL did something I've never seen done before. It looked at how a planet full of oeople with a death sentence would deal with their impending death. In fact, Emily's whole reason for being is to help them deal with such mind-blowing knowledge. I wanted to like this book, but for me not a science fiction reader, this book was all over the place. It was a mess that at some points I got lost and couldn’t follow. Artificial conscience, 2 systems fighting over how the world will deal with the ending of the world, a man and computer program falling in love. It was a bit much for me. I do hope the author good luck and hope others will get it, but for me..... this wasn’t for me. I don't read alot of science fiction books as I find them hard to understand with all the big scientific words and jargon so I don't know how Emily Eternal compares to other books in the genre so I'm judging this book on how I felt reading it. First off I want to say I loved the cover of the ARC and I love the final copy cover even more. It's so vibrant and fits the story perfectly. I probably would buy this book for the cover alone. Emily is the outcome of a labs work on Artificial Consciousness I don't read alot of science fiction books as I find them hard to understand with all the big scientific words and jargon so I don't know how Emily Eternal compares to other books in the genre so I'm judging this book on how I felt reading it. Emily is the outcome of a labs work on Artificial Consciousness which I thought was a nice change from "artificial intelligence" I instantly liked Emily's character. Emily is being hunted by other parties trying to use her for their own agendas. The plot line is easy to follow however I felt like many events were pointless and not needed in the story. The side characters didn't gain my attention and I felt like the only reason I read the whole book was because I enjoyed Emily and her thoughts, emotions and feelings. The romance was sweet and I'm glad it didn't take over the whole story and the love scenes were done tastefully. I really struggled with the beginning of the book because of all of the complicated scientific words. I had to keep asking my boyfriend what words meant which kind of made me feel stupid. It does get easier to follow the further you get into the book which I'm glad about because the writing nearly put me off. This book may be more suited for more experienced sci-fi fans. I have barely read any sci-fi books because of the fear of not understanding alot of the words and this proved that to me. I only meant to start this book yesterday evening but it gripped me so much that I found myself unable to put it down, read way past my bedtime, and stayed awake later than that as I found myself thinking about it long after lights out. Sorry to my boss and co-workers if I'm rubbish and grumpy at work today! So, Emily... she's an AC - Artificial Consciousness. Not to be confused with an AI cos she is so much more. She tags onto people and is able to "read" them. Emotions and thoughts and has been I only meant to start this book yesterday evening but it gripped me so much that I found myself unable to put it down, read way past my bedtime, and stayed awake later than that as I found myself thinking about it long after lights out. Sorry to my boss and co-workers if I'm rubbish and grumpy at work today! As already mentioned I devoured this book. Not this biggest reader of sci-fi (but I am trying to rectify this) I need my books to help me understand along the way; without the explanation being too distracting away from the narrative, of course. Here, the author got the balance perfectly. I was able to understand, and therefore accept, what was happening and that meant for a stronger connection with the story as a whole. Characterisation was amazing, especially Emily. She's smart (understatement) and very funny too. As things develop with her interaction with some of the other characters, we see a really great side of her (love to explain but, you know, spoilers) and I really did like the journey, the awakening, she went on during the book. As well as a cracking story played out by some really well drawn characters we also delve into what it means to be human and the balance between free will and doing what's best. We also examine the "sacrificing one to save many" debate, both of which I found interesting and handles very well. The only downside of the book for me was the romance element. I couldn't quite get my head around all that and it did distract me a bit. But that's a personal thing so I haven't reflected it in my rating of the book. Emily Eternal by M.G. Wheaton is a fast paced novel. Sit down, fasten your seatbelts-it's going to be a wild ride! Emily is a super computer personality. She is able to communicate with people of her team (at a college) who wear an interface chip, fastened to the back of their neck. If you have the chip, she shows up as a person. Her creator Nathan Wyman has made Emily to be an artificial consciousness, (AC), to interface with human minds. They have a college program that is called iLab, that is w Emily Eternal by M.G. Wheaton is a fast paced novel. Sit down, fasten your seatbelts-it's going to be a wild ride! They have a college program that is called iLab, that is where they work. Emily is a talking therapist. There are hundreds of volunteers who are in the program, that Emily works with. Unfortunately, there is a super, life ending event, that everyone is aware of and the President of the USA comes to them to see if Emily can download everyone's DNA and save it to a server and people will jettison that into space, so that sometime far into the future, the DNA can be unlocked so the people of the world can be saved at a molecular level. At first, Emily refuses. She has a morality chip and would rather gather DNA through permissions. But, there isn't enough time to get permission and Emily can just go into their minds and pluck the DNA strands and save them. She eventually agrees to do what the President asks, but insists that She be the one who sends the servers into space. The lab is destroyed by evil henchmen. They are private security types who are bent on killing everyone and destroying everything. Emily hadn't made it to the lab that day, so she lived on. I thought this was a pretty good book, deals a lot with the doomed planet and what we as people can do to survive. The book had some twists and turns, but the end of the book seemed a little rushed. It should have taken longer, that the book did. All in all, it is a good book. I will read it again. I will think about the ending, as well. I really like the concept, full review to come. *I was sent a copy by the publisher in exchange for my honest opinion. I have been trying to get into more Sci-Fi books lately and when I read the synopsis for Emily Eternal, I was so happy to come across one that sounded so intriguing. I generally find that Sci-Fi novels tend to either be hit or miss for me, as sometimes the Sci-Fi aspect can get a bit overwhelming. And there were some moments in this where I wasn’t 100% following, but overall, Emily Eternal was definitely a hit for me. As I said, the premise of the book massively intrigued me and I wasn’t at all let down by what I found within its pages. Interesting, for lack of a better word, is what it was. It grapples with the age old question of what would become of mankind without the Sun, and like the book initially suggests – we wouldn’t have the faintest clue. What we do know though and what this book reflects, is that people would be desperate to survive, as individuals and collectively as a species, ‘In certain quarters, anarchy, looting, overly optimistic mass migrations to areas of large-scale food production, and even wars have resulted. Certain religions see this a a sign…for others, a great numbing has occurred’. People are always going to have a difference of opinions on how to go about things and this book calls into question the humanity we are willing to sacrifice in order to save the human race as a whole. And so you can imagine how fascinating it is to witness an artificial consciousness have to grapple with the near end of the world and more specifically, the role she could play in the future of mankind. The different solutions that the author came up with were so much fun for the mind to ponder on and were just so clever. I don’t want to give away any spoilers, so I’ll just say that the big discovery that Emily made on her own, about the potential for the human race, blew my mind and was probably the most gripping part of the book. As well as Emily’s characterisation, the book itself was very well written and I was really taken with the author’s writing style. I think that the pacing in this was amazing, as nothing felt stagnant, even when the characters were travelling. I was constantly engaged with what was going on, so the bits that were a bit more puzzling to me, weren’t that big of a hindrance. There were also some great side characters in this that made me form even more of an attachment to this story. The characters Mayra and Nathan were fantastic, they were both such strong and well thought out characters, they both brought out a different side to Emily, but the relationship she had with both of them was so heart warming, ‘she shakes her head…I know you say you’ve been “alive” for five years, but you are younger still than that. You’re a child still and one that’s enduring a caustic upbringing’. The romantic relationship in this was very unique as Emily’s obviously an artificial consciousness, but it was a lovely relationship nonetheless, with it being so incredible how Emily went about initially getting to know him, it was definitely another thing that fascinated me. An interesting and emotive novel about A.I and the end of the world. A bit more romance than I expect but enjoyable none the less. Perhaps a little rushed in the ending but filled with original and thought provoking ideas that kept me turning pages. A good Sci-fi novel for people who don't usually read Sci-fi. This book has a really interesting premise, and it started out focusing on ideas. Great, just what I wanted! But then it quickly turned into a page-turning adventure, which was a bit of a let-down. I would have preferred something else. But it was still quite the good read, and there are still things to think about in there. An absolute pleasure to read, so easy to lose track of time and just get ensnared in the narrative. I'm a huge fan of speculative fiction that focuses on AI or in this case AC, artificial consciousness, and this was one of the best yet. There were some concepts that I struggled to visualise at first but I was so swept up in the action that I just went with it and it all clicked. A truly remarkable and enjoyable book, I'm going to be recommending this to everyone. Especially fans of Blake Crouch an An absolute pleasure to read, so easy to lose track of time and just get ensnared in the narrative. A truly remarkable and enjoyable book, I'm going to be recommending this to everyone. Especially fans of Blake Crouch and Becky Chambers. I would never have imagined that I would enjoy a novel with a protagonist who was not human. However, I enjoyed this very unique science fiction book, which focuses on the problems humans face on earth, as told by a narrator whose uniqueness is outpaced only by her curious humanity; curious, because Emily is an AC, or Artificial Consciousness. She is housed in a mainframe, but can appear as human to those around her who are outfitted with an interface chip. Emily is so uniquely different as a ch I would never have imagined that I would enjoy a novel with a protagonist who was not human. However, I enjoyed this very unique science fiction book, which focuses on the problems humans face on earth, as told by a narrator whose uniqueness is outpaced only by her curious humanity; curious, because Emily is an AC, or Artificial Consciousness. She is housed in a mainframe, but can appear as human to those around her who are outfitted with an interface chip. Emily is so uniquely different as a character and a narrator, so fleshed out, so to speak, and a delight to "interact" with. She is funny, self-deprecating, caring, compassionate, and at the same time imbued with all the abilities of a computer, it's hard not to like her. So kudos to the author for creating a being that we want to get to know. I thought this would have a good grounding in science, given the author’s occupation, but its science is hand wavey, and often fantastical. I like Emily as an MC, and her relationship with Jason is the most interesting aspect of the book for me. The rest of the plot just like the movie Transcendence mashed up with Neal Stephenson’s Seveneves. I received an ARC of this title. It’s the end of the world...literally. The only one who can save the human race is an AI. Emily lives in a virtual world and through an interface is able to exist in the real world communicating with humans who are wearing the interface. She has become such a great voice of humanity that there are some wanting to take her out of the equation and finish the way they want. When her creator is murdered in front of her, Emily slips away. She wakes up in the company of I received an ARC of this title. When her creator is murdered in front of her, Emily slips away. She wakes up in the company of one of the students and together they go on the run. They learn so much about each other and the reasons why Emily is so wanted. 3.75. Thank you to Hodder for gifting me with an arc in exchange for my honest review. This book is all about an Artificial Conscience named Emily. The main plot of this book is that the sun is dying and the humans have to figure out a way either to fix it or achieve survival for the human race. Emily is the product of a group of scientists desperately trying to figure out the best method for human survival and or evolution. Emily is coming to grips more and more of her emotions and conciousness 3.75. Thank you to Hodder for gifting me with an arc in exchange for my honest review. This book is all about an Artificial Conscience named Emily. The main plot of this book is that the sun is dying and the humans have to figure out a way either to fix it or achieve survival for the human race. Emily is the product of a group of scientists desperately trying to figure out the best method for human survival and or evolution. Emily is coming to grips more and more of her emotions and conciousness every day, she thinks and feels like she is human. However she learns just how human she has to be and how much computer she wishes she was. With betrayal strife and the end imminent, Emily must not only come to terms with what she is and how she's evolving, but also somehow save the human race in the process. My overall thoughts of this book is that it's well written, well researched and overall well paced! I didn't feel this book was too long or too short, the pacing of the book was definitely well adjusted to the size of it. The information and sci fi babble, so to speak, is very informative and clearly well researched. However, it can get very info dumpy at times and a tad overwhelming and sometimes I found myself having to go back and rereading certain sections again and again to understand them. It also did start a bit slow but once it hit a major plot point it quickly progressed from there, it definitely changed in where the story was going, to a place and point I'll admit I wasn't expecting! The character of Emily is very interesting to me, and I liked that the author focused on making her an Artificial Conscience rather than just a Artificial Interface, it helped me as the reader connect to her more with her empathy and general humanish mannerisms. However, the character is described as visually picturing herself as a woman in her 30s but sometimes the dialogue from this character would be too similar to that of a 14 year old, and I'll admit that jolted me from time to time, and definitely made it feel as though that was a completely new character. I mean she literally says "hashtag humblebrag. Hashtag godlife. Hashtag blessed." That to me was just a weird experience to read! I also didn't care too much for the romance that is plot driven through this story, even though I understand the importance of it towards Emily's character. I didn't feel the story needed it as strongly as it was put forward, or maybe even it would have done better as a slow burner? I really enjoyed the enemy of this book, I won't spoil it, but I will say I had a gut feeling from the beginning as there is a few bits of foreshadowing along the way, but it was definitely a tease I wa happy to read. I do think that the enemy is a scary thought for our current generation and our reliance on certain aspects in life, and therefore made them equally valuable as a villain and plotline as well as connectable to everyday life. Although I was generally happy with how everything went in the story, I have to admit there was just one character death that made me stamp my foot, I won't spoil, but damn you Wheaton! Emily Eternal is a fast paced read that fits squarely with a lot of new ‘AI’ science fiction. It extrapolates a complicated future in terms of how we use technology and in what context it matters. Emily is an advanced artificial ‘consciousness’ and functions as the protagonist of the book. The problem is already apparent when the reader enters the story. The sun is expanding early. The world is ending. This forces the plot and the protagonist into a high stakes context that already has to grapple Emily Eternal is a fast paced read that fits squarely with a lot of new ‘AI’ science fiction. It extrapolates a complicated future in terms of how we use technology and in what context it matters. Emily is an advanced artificial ‘consciousness’ and functions as the protagonist of the book. The problem is already apparent when the reader enters the story. The sun is expanding early. The world is ending. This forces the plot and the protagonist into a high stakes context that already has to grapple with fascinating questions of inevitability. We are made to care about a protagonist that is not fully human, while around her we are told that all of the human race will shortly die. How can we come to care about the outcome when the world will end anyway? Can any ending truly be satisfying? On Emily as the protagonist, the reader is forced to consider questions of agency. Emily is a female protagonist who, at her very base concept, is a computer, and therefore lacks a lot of the agency we have come to consider human. She cannot interact with real time around her unless someone is wearing an interface chip. She is forced to constantly question where her emotions and sensations are coming from. She can be shut down at a moment’s notice. She also has a male creator, which puts all of this in an uneasy perspective. Emily Eternal, however, is (no pun intended) self aware of this problem, and considers it. However, most of it is put into the framework of the reader accepting Emily as fully human. The book assuages the reader by showing Emily as human in everything but origin, or, if it frames it better, a human with supernatural powers afforded to her by her ultra powerful computer brain. How this can be so is not deeply investigated by the book. The science in general comes across as fantastical at times, from the projected evolutionary traits of certain humans to the Emily’s ability to control the host of her interface chip. I thoroughly enjoyed Emily Eternal - it wasn’t quite what I expected having read a short excerpt from the start, but much more in line with the blurb. (I know, I know, obvious!!) I really liked the way the Artificial Consciousness melded with futuristic “real” life in this, and how the science worked. Most of it seemed plausible, given we don’t know how far in the future it’s set. My biggest science issue was actually how I received this book from the publisher in exchange for an honest review. I thoroughly enjoyed Emily Eternal - it wasn’t quite what I expected having read a short excerpt from the start, but much more in line with the blurb. (I know, I know, obvious!!) I really liked the way the Artificial Consciousness melded with futuristic “real” life in this, and how the science worked. Most of it seemed plausible, given we don’t know how far in the future it’s set. My biggest science issue was actually how they created Emily, and I totally get why that’s not included - you’d need an entire book just on the theory of an AC! Hehe. I really liked Emily, and how she seemed both human and not, and the concept of not being able to control when she the “present” was fab, you could sense that it was frustrating for her. And how she interacted without everyone was fantastically done. There’s a great scene where she knows she’s being petty but still storms put properly to prove a point, and I love it. I didn’t love the romance element, though once it had played out I liked their interactions. It was surprisingly well played, given the circumstances. I was also a little frustrated not really knowing more of the motivations behind Argosy - we see a very small amount and then it’s quickly rushed away. That’s probably my main niggle, as it meant I didn’t really get the depth I wanted. That said, the plot is fast paced and well written, and I loved the bio-elements (my favourite bits are right at the end, and so I don’t want to spoil, but I love the ending so hard). I also loved Jason and Mayra, especially Mayra - she rocked! Even though we only see their perspectives through Emily’s eyes, they are much needed in keeping it human and grounded. Emily is an artificial consciousness (which is apparently different to artificial intelligence) who has spent five years working with her creators in order to help humans process trauma. Except this research is put on hold as humanity confronts the ultimate trauma. Planet Earth faces extinction as the sun has begun to expand more quickly than expected. With the sun close to dying, the end of humanity edges closer. Emily is a fascinating character. It's quite hard to imagine what it would be like Emily is an artificial consciousness (which is apparently different to artificial intelligence) who has spent five years working with her creators in order to help humans process trauma. Except this research is put on hold as humanity confronts the ultimate trauma. Planet Earth faces extinction as the sun has begun to expand more quickly than expected. With the sun close to dying, the end of humanity edges closer. Emily is a fascinating character. It's quite hard to imagine what it would be like for an impossibly intelligent artificial consciousness that has the ability to adapt and adjust her programme according to what she learns. We gradually learn that Emily is more powerful than her creators ever dreamed. It makes for an interesting story and does pose the question of whether situations like this could happen in the future. This was an interesting read. There were many moments that I enjoyed and I certainly found it an easy read, but the tale twisted and turned in ways that I did not expect and often found uncomfortable, particularly in the last act, which felt a bit too convenient. Emily Eternal introduces a number of complex moral and ethical questions that were thought-provoking. At the centre is the question, "What does it mean to be human?" A good (if not slightly convoluted) story and an imaginative addition to a crowded genre. This was an enjoyable little dystopian sci-fi romp. It kept me entertained and didn't require too much knowledge on my behalf. Emily is an artificial consciousness (not AI) who has been developed primarily as a therapist, shes a very effective one, being able to enter peoples memories to guide them through the trauma they remember and point them on the right path. Emily's creator Nathan wants her to learn to be as Human as possible so she showers, dresses, eats and 'walks' across campus (with a This was an enjoyable little dystopian sci-fi romp. It kept me entertained and didn't require too much knowledge on my behalf. Unfortunately for everyone though the end of the World is fast approaching, the sun is dying and the race is on to find a way to save Humanity. Nathan and his team have one way and another team disagree. It quickly turns violent with Emily as the wanted prize. All in all this book was a fun romp although Emily evolved rather quickly at points and some of her actions were highly unethical and rather creepy. Great if you went with it and didn't overthink it too much! The premise was soooo good. The story had so much potential, but the writing got in the way. What I mean by that is during the dialogue, you really needed to pay attention to completely understand who was speaking. Then the plot veered and I was lost or working so hard to figure it out, the rhythm of the story faltered. Born in Texas, M.G. Wheaton worked in a computer factory assembling servers and PCs before becoming a writer. His forthcoming sci-fi novel, EMILY ETERNAL, arrives in April, 2019 from Grand Central Publishing. Before turning to novels, Wheaton also worked as a screenwriter on movies like the Michael Bay-produced FRIDAY THE 13th and Kristen Stewart-starring THE MESSENGERS as well as other scripts for Born in Texas, M.G. Wheaton worked in a computer factory assembling servers and PCs before becoming a writer. His forthcoming sci-fi novel, EMILY ETERNAL, arrives in April, 2019 from Grand Central Publishing. Before turning to novels, Wheaton also worked as a screenwriter on movies like the Michael Bay-produced FRIDAY THE 13th and Kristen Stewart-starring THE MESSENGERS as well as other scripts for New Line, Sony, Universal, Miramax, HBO, A&E, Syfy, 2929, Solution Entertainment, Legende, Disney Channel, Zanuck Independent, Blumhouse, Venice Films, Rainmaker Films (UK), and others. Wheaton has also written for video games and comic books, including co-creating THE CLEANERS for Dark Horse Comics. Before this, he wrote for a number of movie magazines with bylines at Total Film, Fangoria, Dreamwatch, Shivers, SFX, L'écran Fantastique, Film Score Monthly, G-Fan, Planet Movie, and more as well as online at E!, Syfy, and TNT's Roughcut.